Vixen (Catherine Christie) is not at all sure about her feelings for Rudy (Matthew Vigil) in “Rudy Rudy Rudolph." You've heard or seen the classic holiday tales such as "Rudolph the Red-Nosed Reindeer," "Frosty the Snowman," "Home Alone" and "A Christmas Story." 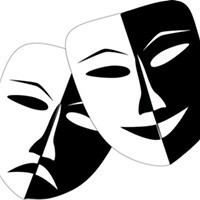 Now, 2nd Street Theater is bringing a new take on those stories, aiming to poke fun at political correctness. Clinton K. Clark's "A P.C. Christmas," opening Dec. 8, involves back-stories offering good humor, striking visuals and a boatload of clever puns. In "The Christmas Story: 20 Years Later," directed by Karen Sipes, it's the 1960s and little Ralphie is back from doing a stint in Vietnam. "In the movie, the leg lamp is very important. Ralphie's dad gets the lamp, which everyone hates, but he thinks it's wonderful," playwright Clark recalls. "In the play, Ralphie has a violent flashback and winds up accidentally breaking the lamp." Knowing how much the artifact means to his dad, and how difficult it would be to find another one just like it, Ralphie realizes he has no other choice but to enlist the aid of childhood bully Scott Fergus, now a sleazy antiquities dealer. A deal is eventually struck – but who will end up with the better end of it? 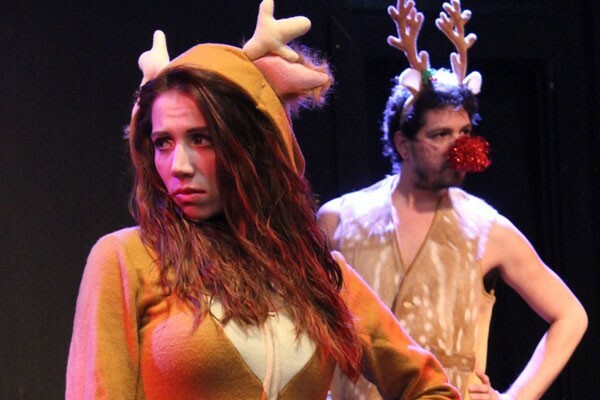 "Rudy Rudy Rudolph," directed by the playwright, re-imagines the budding stag's unique facial feature as an indicator of his coming of age. Rudy is self-conscious about his nose, which is already red but not yet "aglow." He has no clue, though, as to why he feels so different from the other reindeer, until the day he kisses his first fawn—and then his first young buck. Once he figures it all out, his nose begins to glow, and we can imagine the life of awareness and purpose that lies ahead for him. "Rudy has to go through some conflict in order to get the nose to glow," Clark explains. "Basically, he has to come out of the closet in kind of an oppressive reindeer society." In "Less than Frosty," directed by Scott Schultz, the jolly old snowman is melting too soon, presumably due to an unseasonably warm December. His adoptive family is concerned that he may not make it to Christmas day. "He's exhibiting some of the symptoms of dementia. That's kind of the theme of this one, accepting people from an older time who might not be politically correct," the playwright explains. "It was inspired by one of my grandmas who came from Tennessee in the 1920s. Even though it might make us cringe, that was normal for a lot of older people to talk like that." As Frosty's deterioration progresses, he must decide whether or not to check himself into the Cold Folks Home, where he's promised that his frigid life could be extended at least until Christmas. The family soon discovers, though, that promises can be as unreliable as the weather. "Halfway Home Alone" picks up the story from the "Home Alone" movies, as would-be home invaders Harry and Marv get out of prison 15 years later. Meanwhile Kevin, the boy hero who as a child held the bungling burglars at bay while his parents were away, has gotten himself hired as a janitor at the halfway house where Harry and Marv are paroled, "just so he can pull some more pranks on them," says Clark. The costumes, the antics, and the expressions on the players' faces will recall the tale for anyone who has seen the "Home Alone" movies, though the play promises to entertain regardless of prior experience. With so many classic holiday tales to choose from, one might wonder how the playwright decided on these particular gems. "I had to whittle it down to these four," Clark told the Source Weekly. "I almost did one for the Grinch, but I felt these were the best."